With majestic volcanoes, misty cloud forests, stunning river valleys, and hundreds of beaches along the Pacific and Caribbean coasts, Costa Rica is endowed with an intense array of biodiversity and environmental attractions. 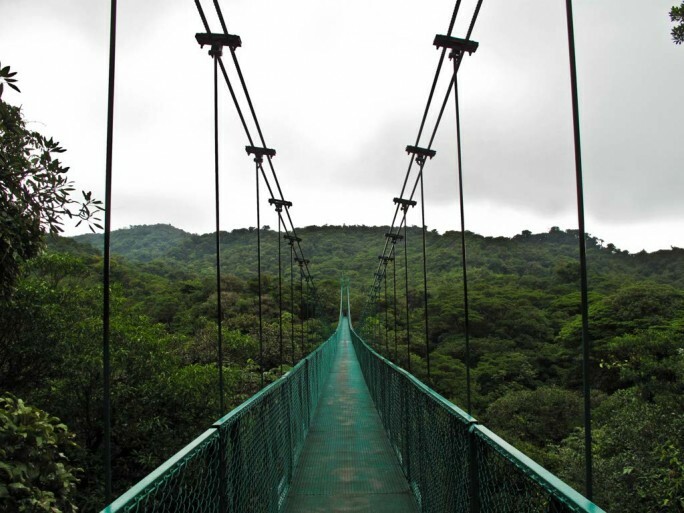 Costa Rica is one of the planets most biologically dense countries with over 500,000 plant and animal species. Arenal Volcano and La Fortuna – One of Costa Rica’s most notable natural features is the Arenal Volcano. This impressive volcano resides within the 29,960-acre Arenal Volcano National Park. The activities within this area are endless. You can go horseback riding, canoeing, fishing, kite surfing, hiking and waterfall repelling, as well as canopy and hanging bridge tours. The La Fortuna Waterfall, a breathtaking 230 ft (70 m) cascade that drops into a misty pool, is just 3 miles south of La Fortuna and makes for an easy day trip. Monteverde – Nestled between two primary cloud forest reserves lies Monteverde. It is a place of cloud forests and coffee plantations, monkeys, mist, and friendly locals.Visitors can explore this internationally recognized environment from trails and trams, along canopy tours or inside museums. Tamarindo – Once a quite fishing hamlet, Tamarindo has evolved to be the area’s most developed and accessible tourist town. It’s a fantastic place to take surfing lessons or develop your already existing skills. Nicoya Peninsula – The Nicoya Peninsula’s sparkling 80-mile shoreline boasts beach-centric towns with cream-colored shores and dense forests. Nosara Beach’s powdery sands line the Nicoya Peninsula’s western edge. Tourism and expat living is concentrated along the coast while the interior is very sparsely populated. Cattle raising shapes much of the landscape with backdrops of the steep-sided and heavily forested inner mountain range. When to Go – The sunniest and driest season in most of the country occurs from mid-December through April. The green season, May to mid-December, offers lush vegetation, smaller crowds, and lower prices. It rains year round in Costa Rica so you should bring a light rain jacket whenever you visit. Money Matters – The local currency is the colón, but don’t bother getting colones before your trip; the tourism industry prices its offerings in dollars Credit cards are accepted by almost all businesses catering to tourists. Food and Drink – Clean tap water can generally be found throughout the country and in most tourist destinations. Additionally, most visitors find that they are free to enjoy the local food without serious repercussions on their stomachs.